Nicolas Laughren assists Patty Bellfry with some technical questions during a Circle of Friends: Connecting Generations program at the senior center Wednesday. High School students come to the centerthe first Wednesday of every month to help out with technology needs, and just to chat. A self-proclaimed “technical dinosaur,” senior Walt Krom said he would be lost without Aspen High School sophomore Grace Lamont’s assistance. Lamont was teaching Krom on Wednesday afternoon how to use his iPad, which Krom said he had no idea how to work. Krom and Lamont’s technical tutorial occurred as part of Aspen High School’s Circle of Friends: Connecting Generations service club meeting on Wednesday. The purpose of the club is to cultivate friendships between all ages in the community and facilitate intergenerational events, Circle of Friends adviser Barbara Bloemsma said. 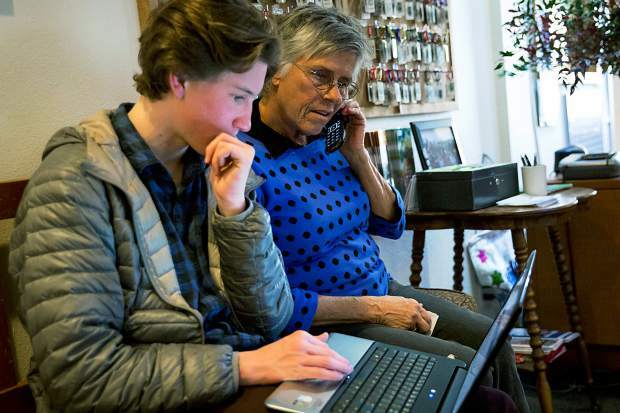 On the first Wednesday of each month, a group of Aspen High School students meets with seniors in the community to help them with their technology needs and also to hang out and get to know one another. Nearly 20 high school students and 20 seniors gathered in the senior center room next to Whitcomb Terrace on Wednesday afternoon. Another one of these seniors was Krom’s wife, Elizabeth Phillips, who also sought the tech-savvy students’ help in learning to use her iPhone. Like Krom, Phillips said the students’ assistance was extremely helpful in getting accustomed to her new phone. Krom, on the other hand, was content with his little black flip phone, which he proudly took out of his pocket at the roundtable. Lamont said she volunteers her time to the organization simply because she enjoys it. “As far as community service goes, this is definitely the most fun,” Lamont said. The sophomore said that she likes to interact with people and that it is more fun than wrapping presents, for example. Another reason to volunteer is for the free food, Lamont said jokingly, in reference to the two large boxes of cookies donated by Paradise Bakery. Krom joked that the kids volunteer to show off how smart they are. From helping with iPads and laptops to social media and cellphones, the high school students proved there wasn’t a gadget or platform outside their area of expertise. When asked whether they needed to meet any tech requirements to qualify to assist others, the students chuckled a bit. The Circle of Friends began as a subcommittee of the Pitkin Senior Services Council about four years ago and has flourished into its own service club at the high school, Bloemsma said. 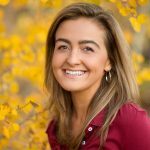 “It has really just blossomed,” Bloemsma said, which she attributes largely to the leadership, devotion and enthusiasm of its presidents, Anna Belinski and Hannah Klauss. In addition to its monthly meetings, Circle of Friends will host its second annual Winterskol Bingo event from 2 to 4 p.m. at Rio Grande Place on Jan. 17.